THE STORY - Seasoned musician Jackson Maine discovers -- and falls in love with -- struggling artist Ally. She has just about given up on her dream to make it big as a singer until Jackson coaxes her into the spotlight. But even as Ally's career takes off, the personal side of their relationship is breaking down, as Jackson fights an ongoing battle with his own internal demons. THE GOOD - A down-to-earth reimagining of a classic Hollywood story with impressive technical skill and fantastic performances that captures all the best parts of the previous versions. ​​​​The story of “A Star Is Born” has been around almost since Hollywood came into existence. Usually the main roles are played by iconic actors or singers-or both-of their time, such as Barbra Streisand or Judi Garland and in the version being released this year the pop goddess Lady Gaga and renowned actor Bradley Cooper, who is also directing (along with writing, producing and creating some of the film's songs), will bring the story to the silver screen. Despite its long history and many incarnations, Cooper manages to bring something that feels authentic and new to the table with his iteration of this classic film story. Jackson Maine (Bradley Cooper) is an aging folk rocker who’s love affair with booze and pills is apparent from the first few moments of the film. One night after a long show when he runs out of liquor, he persuades his driver to stop at a bar where he just so happens to catch the act of a woman named Ally (Lady Gaga) as she is singing La Vie En Rose. Smitten by her gorgeous vocals, Maine convinces her to come with him for a drink where she reveals her songwriting skills and they plunge into a romance for the ages. He invites her on tour with him and before she knows it they are singing her songs in soul-shaking duets on stage in front of sellout crowds. Despite the fairy tale setup, Ally is aware from the beginning of Jackson’s weaknesses and does her best to set boundaries between herself and his vices. It doesn’t take long however for his alcoholism and drug addiction to cause problems and just as Ally is beginning to reach for her own place in the world of fame and stardom, Jackson begins to lose control. With the help of a successful manager Ally rockets to the top of the charts with a hit album, but Jackson has a hard time accepting her newfound success. He pledges to maintain his sobriety and Ally marries him, disregarding her own misgivings and while their world is rosy for a brief time, reality comes calling all too soon and they must find a way to navigate it on their own terms. “A Star Is Born” is well aware of its plots strengths and weaknesses and uses both to its advantage. From the wandering camera and amazing sound mixing that can make what is essentially concert footage feel exciting, to the well-written dialogue that sustains the dramatic moments of conflict and romance, Cooper is doing his best to engage with every scene. With a generous color palette and thoughtful lighting, “A Star Is Born” is rooted firmly in the real world despite its Hollywood setting, making it easy to connect with the characters. Cooper brings his own experiences as a famous person to the story which helps to create an emotional depth that is slowly developed throughout the film with consummate skill. At the heart of “A Star Is Born” are the performances from Bradley Cooper and Lady Gaga, as their relationship is the basis for the entire story. As a result though, all the other actors fade into the shadows of these two giant stars. Playing an addict is nothing new for Cooper and this performance feels in line with those other roles rather than breaking any new territory. Dropping his voice down an octave, learning how to sign and playing a drunk, it's a very good performance but not an all-time great one. Where he truly stands out, however, is when he is expressing his emotion about Ally. His eyes seem to melt in such a vulnerable way and there is an almost palpable heat between the two of them that drives the entire film. While it seems hyperbolic, I can’t help but say that Lady Gaga is perfect for the role of Ally. She, like Streisand and Garland before her, has a big voice and a commanding musical performance style> Without those two things, the role would fall apart. She starts out with none of the glamour, poise, or flamboyant artistry that Lady Gaga is known for, instead she looks almost plain and seems unsure how to embrace her inner self. As the film continues, she begins to acquire a sense of purpose and as she develops as a musician. So too does her style and look, which works so well as a visual representation of her character’s growth. “A Star Is Born” feels a lot like a classic Hollywood film, as it embraces the melodramatic roots of its story, which will surely turn some high-brow viewers off, but it never veers into camp or winks at the camera. It shows the beauty of love and creating art together but doesn’t shy away from revealing the uglier side of those relationships, the judgment and pain that can also come from such a close bond formed so quickly. 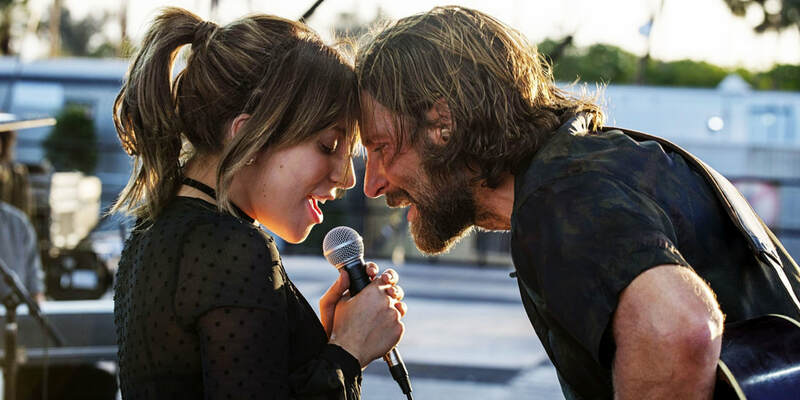 The songs that were created for the film which were written by several people, including Lady Gaga and Bradley Cooper, fit the story very well and also happen to be enjoyable all on their own. Bradley Cooper’s “A Star Is Born” delicately weaves together an excellent script, great performances, and a surprising amount of technical skill (Considering this is Cooper's first time behind the camera) to create something that feels reminiscent of the films that came before it but is also an updated look at the joys and perils of stardom.